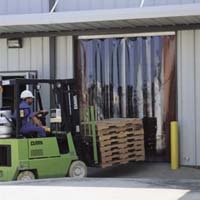 Clear strip curtains and doors are ideal for open docks, shipping areas, warehouse-office doors, cooler/freezer storage, and other places where climate control and access are a priority. They help control dust, debris, and other airborne contaminants, as well as maintaining heating or cooling on either side of the doors. Also, these strips help contain and reduce noise levels. Since a person can walk through them (or a forklift can drive through them) they don't impede access. Contact us for custom strip sizes or specific applications.